Convert to Christianity and writer against the Jews; born at Costinasti, Rumania, about 1860. Until the age of twenty he lived at Buczacz, a small village in eastern Galicia. Leaving his wife and children, he went to Berlin and studied rabbinica at the Rabbiner-Seminar, where he posed as strictly Orthodox; but, failing to obtain a position as rabbi, he became a convert to Protestantism. From Berlin he went to Paderborn and turned Roman Catholic. He published anonymous pamphlets against the Jews. In 1883 he wrote "Der Judenspiegel," a compilation of 100 laws taken from the Shulḥan 'Aruk, and purporting to show the animosity of the Jews against Christianity, of which book three editions were printed at Paderborn. When a Catholic newspaper of Münster, which had published extracts from "Der Judenspiegel," was sued for libel, and Prof. Jacob Ecker was chosen by the court as an expert, Briman aided him in writing his opinion ("Gutachten"), "Der Judenspiegel und die Wahrheit"; but in order to disguise this fact, some criticisms of Briman's "Judenspiegel" were inserted. Afterward Ecker published "Die Hundert Gesetze des Judenkatechismus," a literal reprint of the "Judenspiegel." In his ignorance of Hebrew and of Talmudic writings, Ecker even copied the passages which he had declared in his opinion to be misinterpreted. In 1884 Briman returned to Austria. 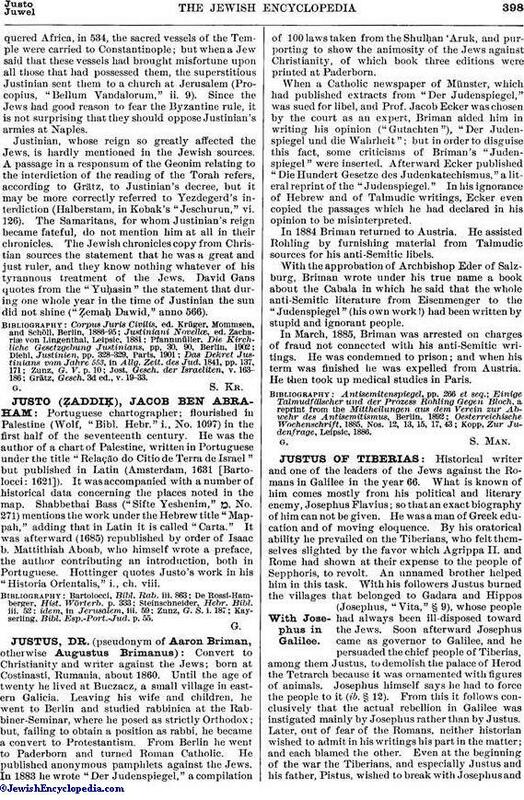 He assisted Rohling by furnishing material from Talmudic sources for his anti-Semitic libels. With the approbation of Archbishop Eder of Salzburg, Briman wrote under his true name a book about the Cabala in which he said that the whole anti-Semitic literature from Eisenmenger to the "Judenspiegel" (his own work!) had been written by stupid and ignorant people. In March, 1885, Briman was arrested on charges of fraud not connected with his anti-Semitic writings. He was condemned to prison; and when his term was finished he was expelled from Austria. He then took up medical studies in Paris. Kopp, Zur Judenfrage, Leipsic, 1886.